The Game Results between the Philippines' Gilas Pilipinas vs Qatar were very interesting knowing that Qatar has bigger guys and despite Marcus Douthit playing hurt. But the Gilas able to win the game tonight August 6, 2013 at Mall Of Asia with a 10 lead in a 80-70 score. When you look at the video replay highlights of the game, it was a thrilling moment for the Gilas Pilipinas in every minutes of the quarter game. Inch by inch, play by play, 1 second is too slow or too late for these team. These were the highlight scores of the game below. JAPETH for a jam! For the last shot for the PHILIPPINES. 80-70 for the win! The lead back up to 11, 78-67. The lead down to 9, 74-65, less than 3 minutes to go in the final Quarter, 8-0 run for Qatar. Gilas lead down to 9, 74-65, with 2:22 to go. Timeout called by Coach Reyes. Marcus is playing hurt. That's what you call heart. Qatar making a run, lead down to 15. Marcus Douthit checks back in the game with 7:35 left and Gilas leading 65-52. End of the 3rd: Philippines 63-44 Qatar. Japeth with another dunk! Great timing from him and Jason Castro! Jarvis Hayes, the tournament's leading scorer, has only 8 points so far for Qatar. Gilas starting to pull away, 32-25, 3:53 left in the first half, Great hustle by Gilas ends with Japeth making a baseline jumper. PH leads 32-25 with 4:00 to go. Hayes scores on a lay-up. Gabe Norwood with a triple from way down town. 20-13 lead for Gilas with 2:51 left. The above highlight scores are based on live blog updates for Philippines vs Qatar last night. The Gilas still able to manage the huge lead until the end of the game. 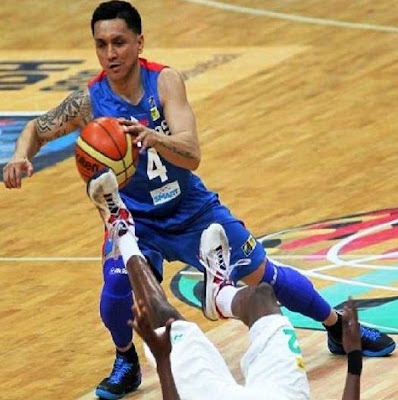 Here's the video replay highlights below from Gilas vs Qatar.